Let’s face it, we all have those nights when we’re wide awake staring at the clock. Counting sheep quickly turns into counting the hours of sleep we’ll get if we fall asleep right now. LOL. Well luckily, there are five essential oils for sleep that will help you in your quest to catch some Zzz’s. 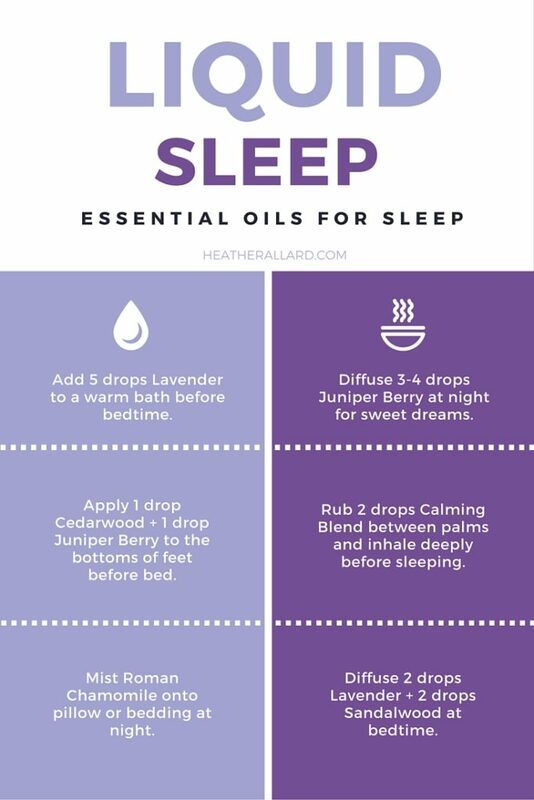 Here are the best essential oils for sleep plus the many ways to use them in a handy little graphic. Warm and woody, Cedarwood has a grounding aroma that relaxes and soothes the mind and body which makes it a perfect essential oil for sleep. Cedarwood is my personal favorite for restful sleep. In fact, I keep it on my nightstand and apply 2 drops of it to my neck and shoulders just before I turn the lights out. Known far and wide, Lavender essential oil has an unmistakable aroma and is used to reduce anxious feelings and promote peaceful sleep. My daughters love when I spray their pillows with Lavender before bedtime. Simply combine 2-5 drops of Lavender oil and one ounce of distilled water in a small spray bottle, and mist into the air or on pillows and bed linens before sleeping. I use these glass spray bottles. Roman Chamomile is another essential oil that is well-known to those trying to catch some Z’s. A very gentle oil, Roman Chamomile can be added to an evening cup of herbal tea (1-2 drops) or applied to the bottoms of feet for restful sleep. Rich, sweet, and woody, Sandalwood instills calmness and is often used in meditation, yoga and massage. Diffuse a few drops of Sandalwood essential oil at bedtime to lessen tension and prepare for rest.